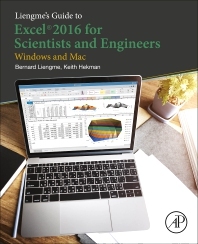 Liengme’s Guide to Excel 2016 for Scientists and Engineers is a completely updated guide for students, scientists and engineers who want to use Microsoft Excel 2016 to its full potential, whether on a PC or a Mac. Excel, as the industry standard spreadsheet, has a range of scientific functions that can be utilized for the modeling, analysis and presentation of quantitative data. This text provides a straightforward guide to using the functions of Excel, guiding the reader from basic principles to more complicated areas, such as formulae, charts, curve-fitting, equation solving, integration, macros, statistical functions, and how to present quantitative data. Dr. Hekman received his BSE degree from Calvin College and received his Master's and Ph.D. in Mechanical Engineering from the Georgia Institute of Technology. Currently he is an Associate Professor of Mechanical Engineering at Gordon and Jill Bourns College of Engineering at California Baptist University where he has taught a freshman Excel and AutoCAD course for the past 10 years. Prior to coming to CBU, he taught at Calvin College and the American University of Cairo.